To be honest, I am growing a little tired of running race challenges. While I still love running and racing as much as i always have, the idea of running multiple races during the same weekend is starting to lose its appeal for me. 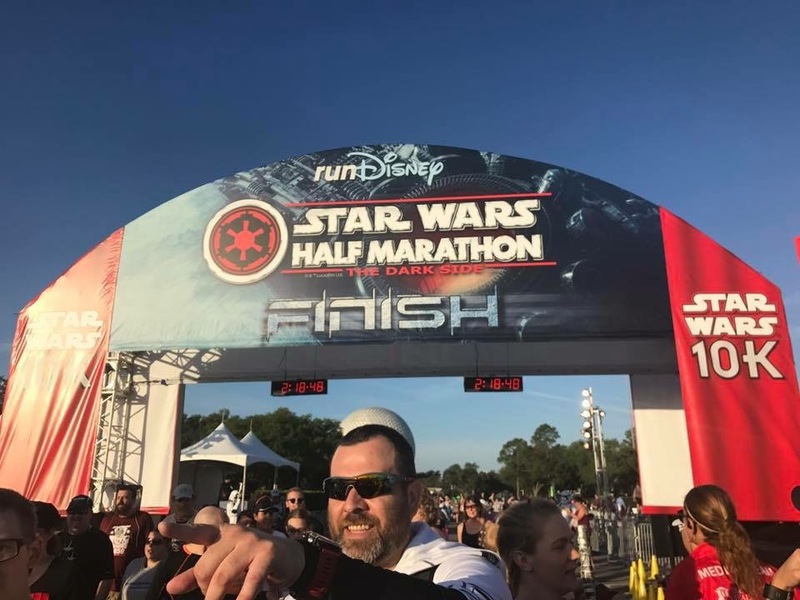 So, while I knew after running the inaugural Star Wars Dark Side Half Marathon that I would definitely run it again in 2017, here I was, trying to decide whether I would sign up for the challenge and run the 10k event as well. All of my close friends were planning on running the challenge, so the pressure for me to do so was on. In the end, no joke, I flipped a coin. Yup, I flipped a coin. As a result, I signed up for the challenge again and committed to running the 10k. Speaking of being over things, I have been to so many runDisney expos at this point that, frankly, they are just more of an obligation than anything else. I appreciate the effort that goes into these, and first time runners will no doubt find them magical, but they are just all the same to me. I go because I have to, not because I want to. The crowds on Thursday for the opening of the expo were pretty large, but by all accounts not nearly as bad as they were for last year’s Star Wars’ races. Fortunately, I had other commitments and got to wait until later on Friday to go and so I skipped all of the crowds and the craziness. I was in and out with my bib and race shirt in no time, which was just fine with me. As far as swag goes, you know the drill. Other than race shirts, runDisney does not put effort into the swag game. The event shirts this year were fine: the same good quality Champion tech shirts with custom logo designs. The logos, at least to me, seemed to evoke a European soccer club feel, which was an interesting take. My biggest props however go to the fact that the shirts are SHORT SLEEVED! 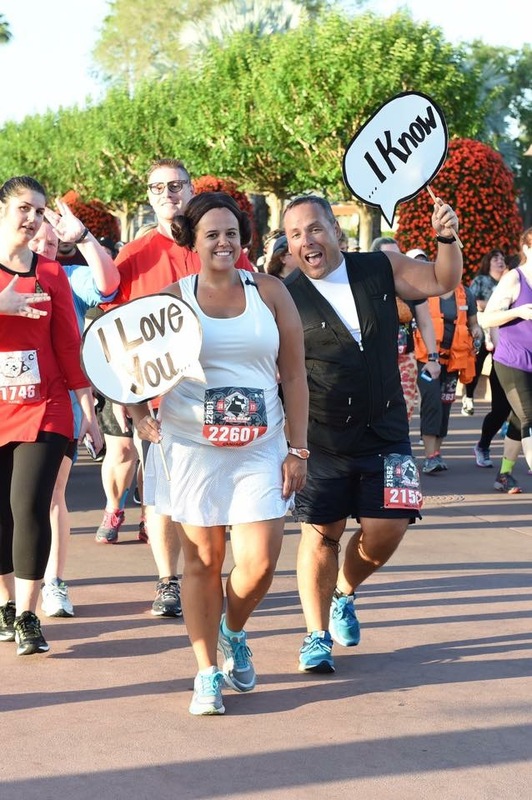 I have said it before, most Casual Runners love boasting their runDisney shirt game (thanks John and Sarah for the term!) while visiting the parks, which means the long sleeves are far less useful than short sleeves. So I was glad to add three more short sleeves to my Disney parks wardrobe. 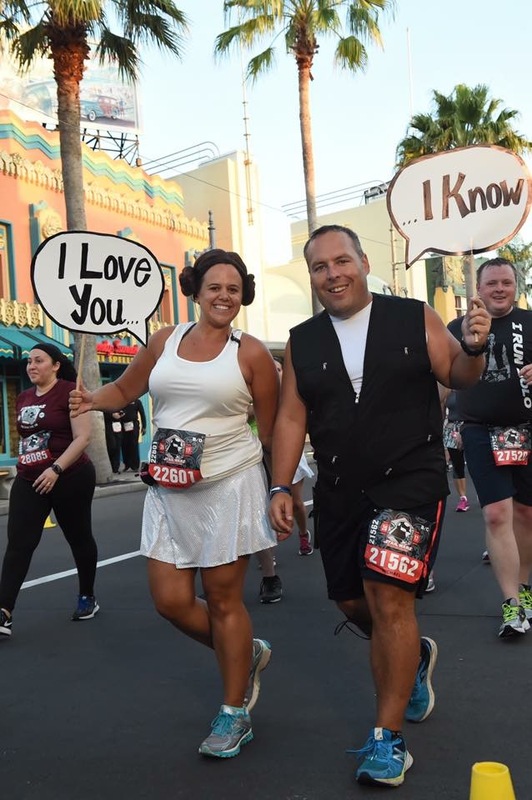 She did a great job of compiling a great, but runner-friendly Han Solo and Leia combination for us. She will bring you more about this in the future, but the best part were the dialogue bubble signs she made for us, which made for some truly awesome race photos. We stayed at the Polynesian Village Resort specifically because we knew it would be close to the starting line in the Magic Kingdom parking lots (specifically the Mulan lot). 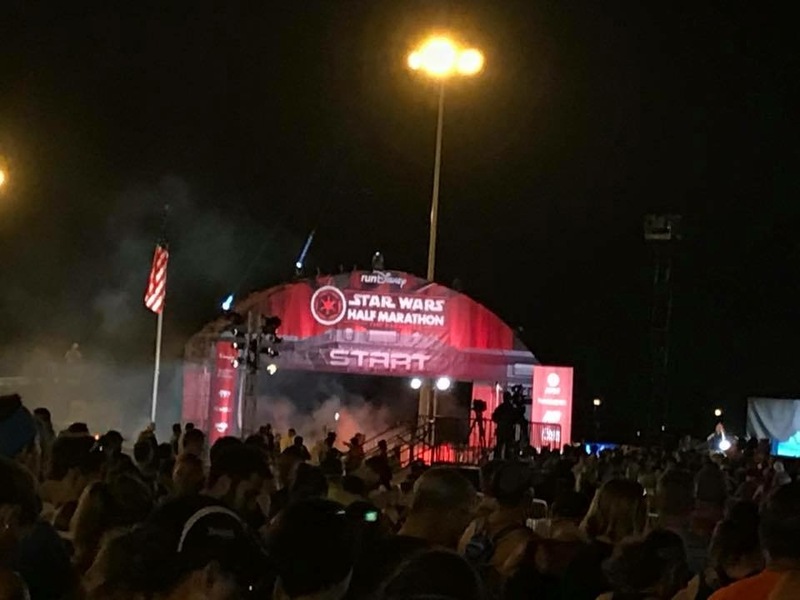 This worked out pretty great as we managed to squeeze in some extra sleep (our friends may have texted us from the starting corrals while we were still in bed!). The biggest snafu was, while Poly guests were allowed to walk to the starting area via the “marked path”, we could not find this path and none of the cast members knew where it was either, so we opted to ride the event shuttle, which took us to two other resorts. At least we figured out that all we had to do was walk to the TTC, which would be helpful the next morning for the start of the half marathon. The security lines were efficient and they had the usual assortment of pre-race Star Wars photo opportunities, but the lines were all too long, so we opted to skip them and load into our corral. They also had the standard Disney DJ and host announcements, but the biggest highlight was the playing of the new Star Wars Episode 8 movie trailer and clips from the franchise. Now, for my race plan. When running any challenge, the primary objective of early races is to “do no harm” and save yourself for the remaining races in the challenge. Given this, Candace and I decided to run together (hence our coordinated costumes) and stop for as many photos as we could. But we had no idea just how well this would work out thanks to a little Disney magic. The race started out heading south on World Drive reversing the course from the WDW Marathon and Princess Half Marathon courses. We past a high school marching band playing the Star Wars Theme, so I of course partook in a high-five line (still one of my favorite race traditions!). 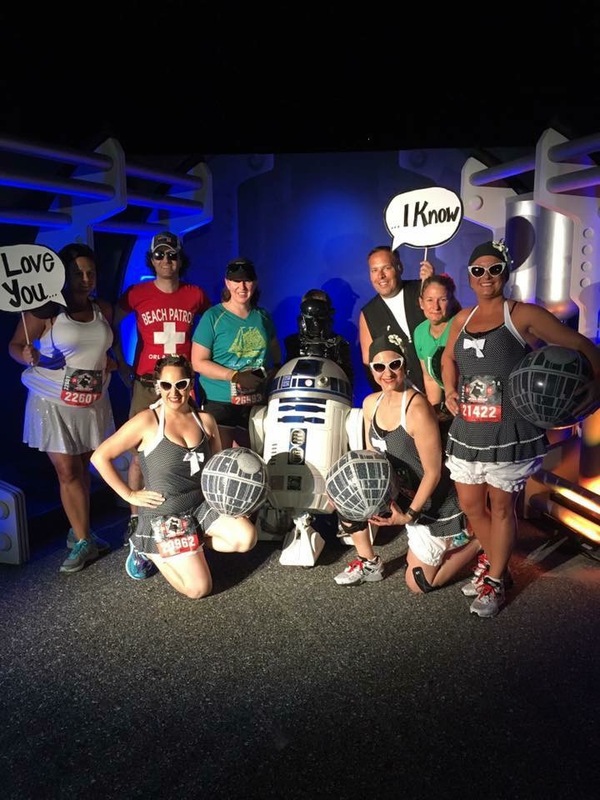 The first character stop was R2D2, so we stopped, and, to our delight, we ran into Kim, Gail, and Kylie from Run All the Races! We had so much fun catching up with our friends in line that we decided to run together for a little while (which turned out to be quite a bit longer). We had a good sized group that would be sticking together, so we had to be mindful not to block or interfere with other runners. Fortunately, we had a group of experienced racers so everyone was very mindful and courteous as Kim called out the intervals for us. Kim’s son was also running, so he and I would run ahead and grab a spot in character photo lines. World Drive made for a great start to the race as it provided plenty of space for the crowd to spread out and for runners to find their groove. We would stop for two more photo stops on this stretch: characters from Star Wars Rebels and an obligatory photo in the Emperor’s throne. As we were leaving this second stop we found our friends John and Cindy from Not Real Runners, who had just joined the line as well as our friend Jason from Disney Good Eats. 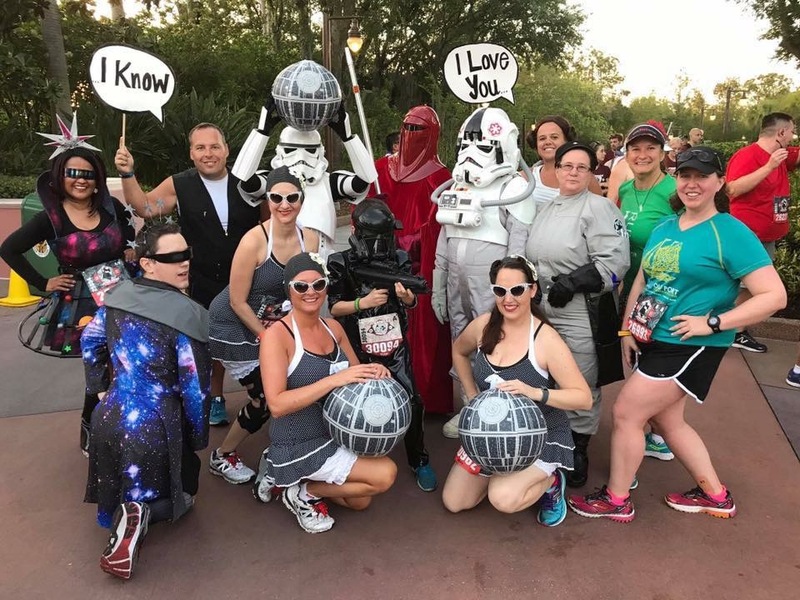 We said hi and told them we would wait for them at the next character stop…it was amazing how we were running into so many of our friends on course! I should add that, as we were waiting in line our friend Ashley ran by, but she was having a great race and wanted to continue on so she did not stop. At this point we were ready to start the large, sweeping ramp to transition us from World Drive onto Buena Vista Drive. We thought that this would be much like the dreaded ramp during the Princess Half Marathon, but it turned out to be much better. In fact, it was so much better I would not mind running this one again. One on Buena Vista, we made our way to backstage entrance to Hollywood Studios, where we joined the line for Darth Maul, where John and Cindy joined us. At this point, our race had turned into a full on party with some great friends! We entered the park behind the Fantasmic theater where we encountered a water station, a short uphill climb, and then cosplay-palooza. An assortment of cosplayers gathered for photos inside the theater and we joined whatever lines we could. The best part about this location, while, admittedly a little chaotic, was that some of us could join lines while others used the bathrooms located right there. Jason joined us at this point and we would finish the race with him. Enter the balloon ladies! I was about to experience something I have never seen before at a race. While we waited in line we heard the calls from the on-course support riders telling us that the balloon ladies were approaching and that we were all in danger of being swept. What followed was kind of crazy, John described it as turning on the lights and watching the cockroaches scatter! The balloon ladies (who are awesome by the way and provide a great service) appeared and runners started scattering to get ahead of them. We were not worried as our legs were still fresh (thanks to the many stops and walk intervals) and we knew we could easily get ahead of the sweep line. We made our way down to Sunset Boulevard and turned left onto Hollywood Boulevard, of course slowing down to pose for the on-course Photopass photographers along the way! We turned left just before the park’s main entrance and then entered a backstage area before turning right and exiting the park towards the walkway to the Boardwalk area resorts. The park’s day guests were arriving in big numbers, and several stopped to cheer us on. Once on the walkway, things got real crowded real fast. Because of this we were forced to slow down and walk. When they could, some runners shifted off the path onto the adjacent roadway. We went past the Boardwalk, Yacht Club, and Beach Club resorts and entered a backstage area of Epcot before entering World Showcase in the UK Pavilion, and turned left to head towards Spaceship Earth and the big finish! 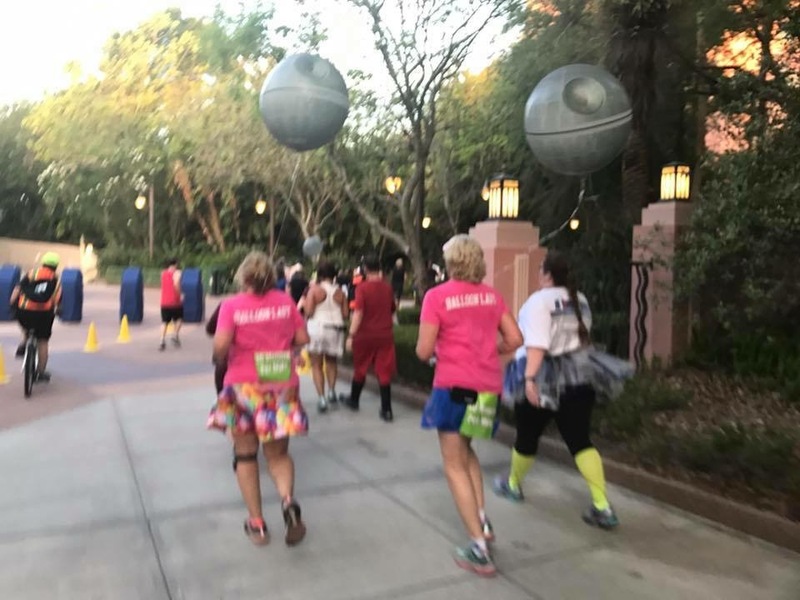 This race would end as many other Disney World races end, by exiting a backstage area near Spaceship Earth, past some more cosplayers and into the finisher’s chute. By this point, we were so far back in the field that most of the bleachers were empty as the spectators had moved on. We did not care, we had a fun time and we crossed the finish line with our friends! Now it was time to grab out bling, shut down, and rest up for the next day’s half marathon. I know, I know, I am hard to impress and runDisney really has set the bar high for race medals, but I am just meh about this one. 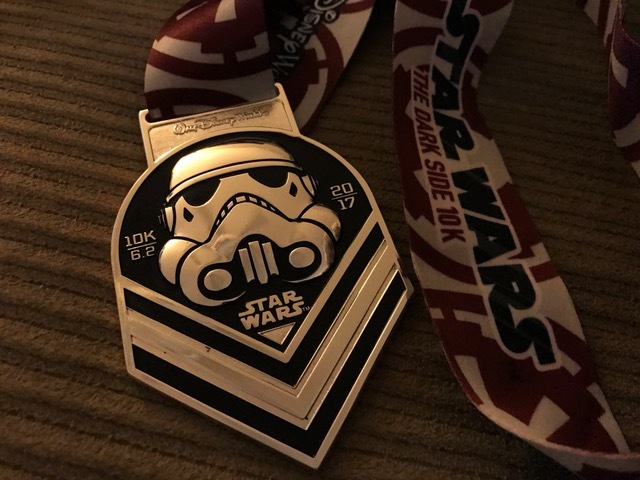 I like the storm trooper and the lanyard is cool, but the medal is just ok. The same pre-race character photo opps were at the post-race as well as the standard Disney dj entertainment. They had food and drinks for purchase, but we opted to grab our Powerades and snack boxes and head back to the resort to shower and for a day at the Disney Water Parks. I honestly cannot remember what I listed to during this race! I know, right? I did not make a playlist for this race, but soon after joining up with so many friends I actually ditched the headphones and, believe it or not, ran most of the race without music. I guess I did give in to the power of the dark side! First, I loved this course. 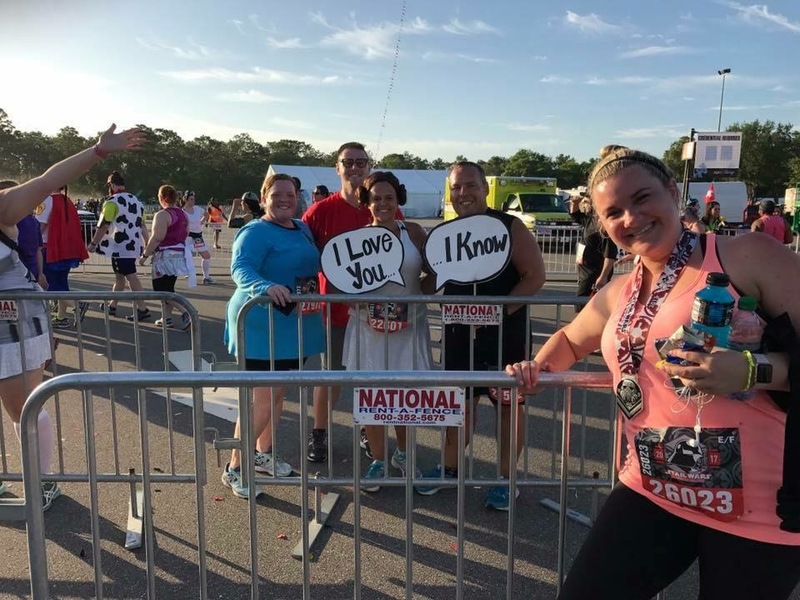 It is, without a doubt, the best Florida 10k course runDisney offers and is a noticeable improvement from last year’s course. Second, I found the number and selection of on-course character photo opps to be disappointing. Additionally, the lines moved slowly which lead to longer lines than I normally encounter in runDisney races. 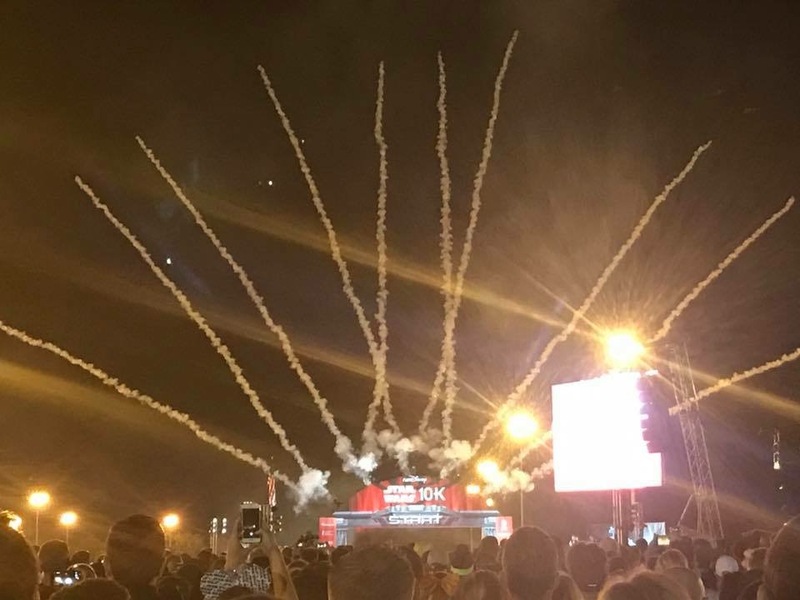 Third, runDisney needs to ditch this whole wave start concept, it is an insult to runners. Here is the deal, instead of making more, smaller corrals, runDisney creates fewer, larger corrals. Once inside the corrals, they have volunteers pick a spot and run a tape through the crowd and split the corrals into waves. While I appreciate the attempt to reduce on-course crowding, this method does not work. Here is why, from the runner’s perspective, you have no idea when you are starting the race. Unless you happen to be on the tape, you do not know if you are starting in wave 1, 2, 3, or whatever. All of a sudden, you just go. This is a disservice to the runners who, as a result, can be caught unaware and get their race off to a bad start. Fourth, speaking of corrals, Laura and Jason got to their corral early so they could be at the front. It was an experience that they wanted and it worked for their race plan. However, to their surprise (and disappointment), race officials loaded runners into the starting chute from the middle of the corrals. This makes no sense and, unfortunately, meant that runners who got their early to be at the front wound up at the back. I am still scratching my head at this one. Fifth, the lack of water was bad. There were three water stops on the course. 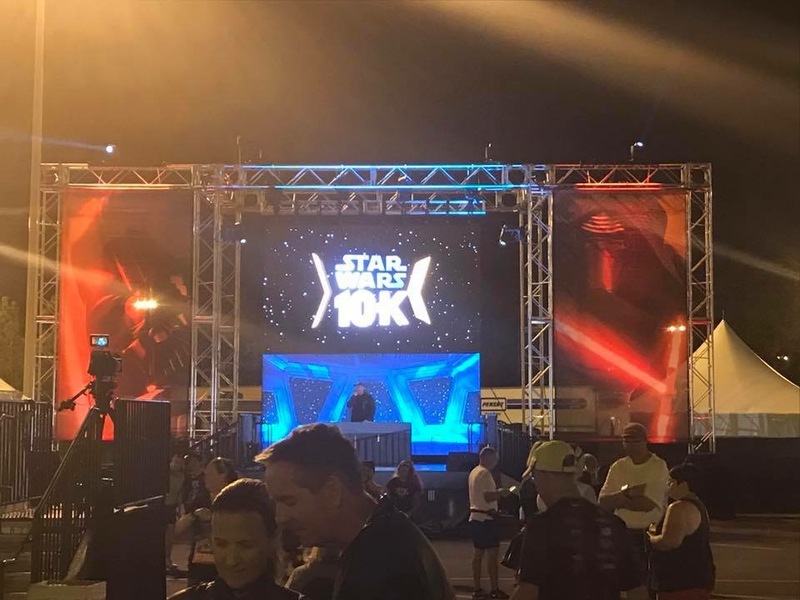 This is typical for a local 10K, but not what is expected for a runDisney 10K. Three water stops was also bad considering they were flagging the course for increased temperatures. If you’re concerned about a race being too hot, extra water is a must. The last water stop was with over two miles left. For us we were told this would be the last water stop, but some of our friends told us they had not been told this and had expected there to be the usual water stop on the backstage of Epcot making them very disappointed when there was no water there. So, what you have all been waiting for…will I run this race again? I did really enjoy myself and I think it is a very good 10k (despite the problems mentioned above). However, I do not think that I will run it again next year, as I will likely opt to run just the half marathon and forgo the challenge. Thus, I may retire the 10k from my race calendar. 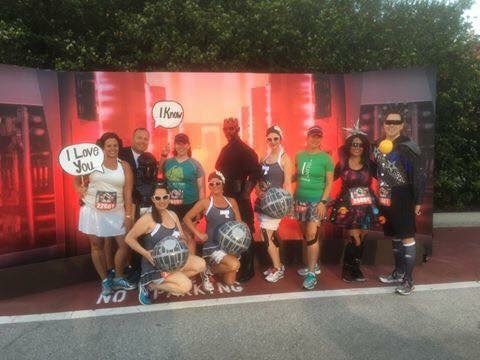 We have even more great articles regarding runDisney’s Dark Side – Star Wars Weekend!